Napoleon’s Prestige PRO Series PRO 500 proves that cars aren’t the only things that have style and performance in one package. This slick grill looks and performs like its name. Professional. 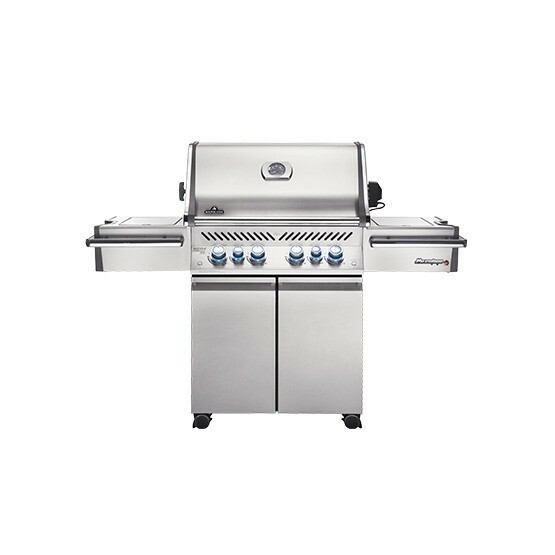 Built from top to bottom with high-quality, high-performance features designed to make every cooking experience not only easy but impressive. Start at the bottom with the new EASY ROLL™ locking casters so you can relocate and position smoothly; sleek soft-closing doors that make a difference every time you open them to access the fully integrated storage shelving illuminated with interior lights; and on the inside of the door we added an extra shelf and a bottle opener for… well why not? Every one needs extra storage and a bottle opener handy at all times.